Retirement is a stage of life where people withdraw from a position of active employment. According to retirement no longer focuses entirely on an event that occurs when one ends their primary working career, but it is now a stage of life and stage of human development that can extend beyond full-time work to part-time employment and the stoppage of work for pay. This research focuses on the withdrawal from full-time work and the factors that contribute to retireesa well-being in retirement. Retirement models, for the most part, have focused on financial resources such as income and personal assets. However there are other factors that shape retirement beyond finance and health benefits. The literature supports the need to amplify the focus of research to include more of what impacts peoples decisions to retire and their happiness after they retire. Researchers found what they called the happiness factor. They defined this factor as (a) the sense of control an individual has, (b) their social relationships, and (c) their financial status. Quality of life is another way to define the happiness factor, also called contentment. Happiness is realized quality of life: income, wealth, social status, or health measures of potential quality of life. Retirement, Financial, Working career, Workforce, Retirement contentment. There has been dramatic increases in life expectancy on a global level [1-3]. For example, “the 65-and-over population is projected to increase 188% between 2010 and 2050” Suzman & Beard . Working with the National Institute on Aging (NIA) Suzman and Beard found there has been minimal research to analyze the non-work activities of this population, such as (a) leisure, (b) care of the household, (c) children, (d) elderly, and (e) self-care. According to Friedberg, Sun, and Webb, “work affects both the time available for non-market activities and the times at which those activities are performed – and therefore workinduced constraints on time use may influence retirement decisions” . Friedberg et al. found increasing lifespans cause workers to either delay retirement for financial reasons or retire earlier to reduce the time constraints they feel are limiting the activities that contribute to their wellbeing. In their conclusions, they recommend additional study on factors related to retirement that include financial resources, income, assets, and expectations for happiness and contentment, in consideration of plausible relaxation of time constraints that may enable workers to make well-informed retirement decisions that lead to their overall happiness and wellbeing. This study sought to determine retiree opinions related to their perceived contentment in their retirement stage of life. It studied AARP members who were retired or would soon be retired and were members from the Mid-Atlantic States. The findings are a necessary component in assisting human development professionals to better prepare the workforce for retirement. 1. How do resources, such as income and financial assets, influence happiness and contentment in retirement ? 2. How do time and personal constraints affected by age and stage of life of an individual factor into their retirement decisions ? 3. How do contentment factors of retirement lead to a positive, confident approach as people moved from active employment to their next stage in their life ? Bender proposed that “happiness or well-being, should be an area of keen economic interest”  in researching the reasons for, and effects of, retirement. This research uses both quantitative and qualitative analysis to study a significant and diverse population, the factors that led or are leading to their retirement, and the impact of this next phase of life had on their contentment. Literature on work will first be reviewed in relation to its impact on retirement. Literature on retirement, and its relationship to retirement contentment, will then be reviewed. This will provide a background to this study. For most, retirement is the stage in life that comes after work for income and financial resources are established. “If you ask people why they work, many will say it’s for the money” . In this context, the first part of one’s life is for education and work preparation and learning to provide for oneself and family. This is preparation that is done through interactions with family and formal education. Interactions with family members show people how to care for themselves and learn the traits of their culture. Education provides the primary knowledge to get along with others and gain basic knowledge to function at home and work. People learn that work needs to be done to make the world function and that work provides money for living. Most humans work for income and/or run a household. They also learn that the final part of life is retirement from work. People learn that work is an essential part of life. Work is important to individuals for economic, psychological, and social reasons. Personal/family economics is the prime reason most people work. To survive one needs the essentials of food, clothing, and shelter . To obtain these essentials, income is needed. Most do find work to meet these basic economic needs. However, many want more than the basic essentials. Because of the want to fulfill economic needs and growth, each generation has become better educated and seeks more possessions (e.g., clothing and accessories, living in more elaborate homes) [8,9]. In addition, “the extent to which people find congruence and sustainability in their patterns of occupation that meet biological and psychological needs within their unique environments can lead to reduced stress, improved health, and greater life satisfaction” . The Insured Retirement Institute (IRI) has studied Baby Boomers each year as they progressed toward the retirement stage of their lives. Their findings (an internet interview of 803 Americans ages 52 to 68) revealed a trend that Boomers are working longer (past 65) for several reasons: “the instability of social security, the larger percentages of income at age 70, and their perception of basic needs that include their children’s education, electronic gadgets, travel, and leisure activities” . In short, economic drive and uncertainity keeps many working. While working, people learn the psychological values of work. Work can make people feel good and bad about their value to an employer and society. Using the National Career Development Association's Career Counseling Competencies, Niles and Harris-Bowlsbey  found that if people make sufficient economic return from their work, they feel good about themselves. If the economic value of work is not sufficient, this can make people feel bad about their economic worth. Loss of work, as many experienced in 2008 due to economic recession, has a negative psychological effect on individuals and society. In 2016, if employers did not sufficiently recover from the economic recession or chose to sufficiently pay their employees, psychologically workers did not feel very good about their work, since they may not have earned a raise in their salary. The private sector has been doing better than the public sector in recent years economically. State governmental representatives have heard from their constituents and talk of state employee raises is occurring in many general assemblies. However, workers want more than their salary and healthcare needs met. Many seek a work-life balance. “Consequently generations of Americans have viewed work as a place to make a living, but living itself takes place after hours” . All psychological values from work are not economically related. Doing a good job at individual and group tasks is also psychologically enriching for workers. If a project or product is done well, employees feel good about their performance. Groups of individuals feel good about achieving team goals. Praise from others also enhances the psychological value of work . Because of the psychological value of work, some workers want to work beyond their retirement ages. Work also creates social relationships. Most people work as members of a larger group. Co-workers become friends. There are also mentorship relationships that are established in work organizations. Others teach us how to do our job and how to succeed. These social reasons , along with the psychological and economic values, make many enjoy going to work. These reasons for work are important and can contribute to who we are. However, workers also enjoy leisure – time away from work. Workers talk about what they do away from their time at the job – evenings, weekends, and vacations. These times also have social and psychological benefits to many. Some value leisure more than they do work. Either through planning or as a result of work change, people retire. The reasons to retire vary (age, health, economic assets, needed change, loss of work, etc.). In retirement one is to have more time to choose how they will live the remainder of their life. Retirees use this time for leisure or other forms of work (voluntary or paid). Will retirement life provide the same amount of contentment as work life for retirees is a question many consider before retiring ? Retirement can be strictly defined as “leaving a job permanently” . However, in his research on determining whether a person is retired, Rutledge, while examining decisions to retire, found retirement had ‘quasi-strict’ definitions that required further analysis. Some of those included leaving a job and returning in another capacity, searching for another job with more flexibility, caring for children, elderly, and sick, volunteering, and fulfilling other personal goals. However, other literature shows there is a continuous theme of life expectancy with financial and healthcare factors influencing the state of happiness and contentment of retired individuals. Bender states, “focusing on just the economic well-being of individuals may miss other factors that influence overall well-being” . According to Rutledge, it is necessary to research the status of retirees to base it on “the strictest definitions of retirement”  by asking whether “leaving the labor force was voluntary or involuntary”  due to personal health or that of a relative, a disability, personal obligations, going to school, or others. Rutledge found that “the availability of resources like Social Security retirement benefits, high net worth, and defined benefit pensions appear to encourage retirement” . Parallel to this consideration are findings by Elder and Rudolph  that suggest a “strong positive correlation between retirement planning and eventual retirement satisfaction, and a negative correlation between the involuntariness of retirement on retirement satisfaction”. Those of age to retire and collect Social Security and pension benefits are well prepared if they have savings in place to augment their financial security and are more likely to find satisfaction and contentment in this phase of life. However, if they are of age and unemployed, some grow discouraged, stop looking for work, and consider themselves retired . Rutledge, surveying older individuals who retire after job separation, found that “statistics by age suggest that the availability of Social Security retirement benefits plays an important role in the decision to retire after a job loss” . Due to increasing life expectancy, the age of a person and their financial status is a consideration in studying the contentment factor within retirement. One of the consequences of living longer is a need for increased financial and healthcare resources. Also a sense of contentment may influence the health of the retiree in a positive fashion. Research on the effects of health on longer life expectancy concluded that “as subjective well-being is known to influence health, a positive state in retirement has positive effects on health expenditures” . Research published by the National Bureau of Economic Research shows that work reduces the opportunity for personal care and leisure. With the numbers of those of retirement age increasing, the research literature shows that those workers are willing to work to provide mentorship and experience, but at reduced and convenient hours. Time for “home work, personal care, sleeping, eating, drinking, and leisure activities”  will enhance the retirement experience. By better understanding the relationships of work and retirement to human contentment, human resource personal can provide information sessions that may assist workers to know when it is right for them to retire. Just because they have a stable financial plan does not mean workers will be content when they retire. The researchers sought to better understand the concept of retiree contentment. Development of generalizations about retirement and retirement contentment of those who retired could assist human resource managers in planning programs to better educate their workers before they make retirement decisions. The research design selected for this study was the survey method, a non-experimental quantitative research tool. Fraenkel et al. described the survey as a method that can be used to “describe the characteristics of a population”. These authors noted that in other types of research “the population as a whole is rarely studied” , and the survey method allows for a “carefully selected sample of respondents” to be studied. From this data, a “description of the population is inferred from what is found out about the sample” . For purposes of this study, a cross-sectional survey was administered to gather information from a predetermined population at a predetermined point in time. Gay et al. noted that cross-sectional designs are “effective for providing a snapshot of the current behaviors, attitudes, and beliefs in a population”. Creswell stated that a cross-sectional survey design has the “advantage of measuring current attitudes or practices” . The instrument designed to collect data in this study sought to answer the research questions posed by the researchers. A literature review assisted the researchers in structuring the survey. Questions were developed from Bender’s  retirement work at the Center for Retirement Research and Helman et al. research reported by the Employee Benefit Research Institute (EBRI) . Additional interests of the researchers were added for answering questions to better understand the contentment of those who retire. The questions were structured so respondents could click on and select answers to an online survey. Some questions allowed respondents to enter comments to clarify their selections. There were 30 questions within the survey. The survey questions were created to weigh the factors that contributed to retirement decisions, such as time, money, health, employer incentives, and others added by the participants. The study also sought the typical baseline demographic data concerned with gender, location, type of employment prior to retirement, salary, age, and education. Data were collected using Survey MonkeyTM. This data collection method allowed the researchers to gather quantitative data from the participants. A population that approximates 5000 was surveyed for this research and it included members of the American Association of Retired Persons (AARP) Mid-Atlantic Region. After data were collected and analyzed, personal interviews were conducted with five volunteers who agreed to provide additional follow-up information to the survey questions. Participants could volunteer to participate in a focus group when they completed the online survey. These interviews were conducted using an online focus group strategy and sought qualitative data. The identity of these participants were held in confidence. There were 507 responses to the survey (10.1%). This response size was significant for a population size of 5000. The 507 responses provided a 95% confidence level with a confidence interval of 4.13. The researchers analyzed the responses from the participants applying descriptive statistics to find what led to their retirement and the impact of this decision to retire had on the next phase of life and their contentment with this decision. First, the researchers wanted to determine the factors that weighed in to their decisions to retire. Options provided included (a) Time in lifespan to retire, (b) Time for personal life goals, (c) Money sufficient to retire, (d) Employer-offered attractive retirement incentives, (e) Poor health that led to retirement, and (f) Other (an area was provided for specific qualifying factors concerning their particular choices). Participants could choose to opt out of the comment sections and could also select more than one option, as they often did. The highest number of responses (n = 261) indicated the top consideration for retirement was financial, which mirrors Rutledge’s  findings that financial resources were a strong factor in retirement decision making. The second highest factor recorded was their time in life to retire (n = 217). The third factor was time for personal goals (n = 163). Both the time in life and time for personal goals are consistent with the findings in Hamermest and Donald . For the 507 participants, there were few financial incentives offered to have them retire (buy-outs), but several reported poor health as a factor in their retirement decision-making as seen in (Figure 1). Figure 1: Factors that weighed in to the retirement decision. These motivational factors are important to this research, since previous research  examined retirement satisfaction relative to decisions that were involuntary as opposed to those that were planned and voluntary. The respondents were asked to check their retirement status as either voluntary or involuntary. Of the 90% (n = 458) who answered this question, the highest number were voluntary retirements, 84% (n = 385), and this was reinforced by their choices for leisure time and travel. Additional comments included it was the age to retire and life goals were positive. Reasons for retiring that were selected were to use their time to pursue personal goals or move closer to family. There were 121 expanded comments under the category “Other” that added specific details concerning the participants’ choices to retire. Their comments were filtered and categorized according to the most common themes that weighed into their involuntary retirement. They noted a variety of reasons, such as changes in their work conditions, closure of their business, company reorganizations, stress, bureaucracy and negative conditions at work, necessary care giving, ill health, and unemployment that created a need to qualify for Social Security benefits. Additionally those responders who moved forward into a second career expressed their need to do so as part-time workers and/or volunteers. This aspect of the next phase of their lives aligned with Kim and Feldman’s study finding that “older workers try to sustain structure in their daily lives by participating in the activities they value most highly” . Their comments showed they were ready for retirement from full-time work, but they still wanted to work on their own terms. This initial question set the foundation for the discovery of the most prominent factors that motivate retirement and the subsequent contentment and sense of satisfaction once retired. Participants were then asked their occupational pay status when they retired. The majority was fully employed when considering retirement and was thus making a voluntary retirement decision. The minority surveyed was not. There were four paid volunteers and 10 unpaid volunteers who ceased employment, as reported in (Figure 2). Respondents were also asked to identify their occupation upon retirement, using a list developed by the researchers from the Occupational Outlook Handbook . The largest numbers of responses were recorded as professional occupations, such as education, 18.5% (n = 90), management, 11.5% (n = 57), healthcare, 11.1% (n = 54), architecture and engineering, 9.4% (n = 44), business and financial, 8.4% (n = 41), sales, 6.2% (n = 30), and computer and information technology, 6.2% (n = 30). Sixtyeight (14%) comments came from unemployed, self-employed, and others who were unable to fit themselves into one of the categories provided by the researchers. 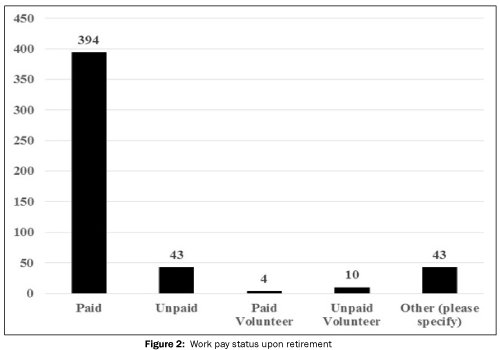 Figure 2: Work pay status upon retirement. Participants were asked to rank steps they followed when they identified that they were planning to retire. Most participants, 94% (n = 477), discussed their retirement first with their families, then they discussed it with their fellow workers, 93% (n = 471), and then their boss, 93% (n = 471). Once respondents reviewed their financial situation, 92% (n = 466), they told their clients, 91% (n = 463). Next, the majority met with human resources to discuss the retirement process, 91% (n = 460), checked on their healthcare options, 91% (n = 459), and Social Security benefits, 90% (n = 456). Figure 3 shows the order of inquiring and telling about their retirement process. Figure 3: Rank order of steps to retirement. Comments that were added by the participants about the order of events to retiring showed financial preparations ranged from selling their businesses, consulting with financial advisers, paying off bills, setting up annuities, and downsizing their housing. Some participants looked into moving to other states with less tax burdens and less expensive living conditions. Participants had differing views about meetings with human resources representatives. Some found the information very informative and supportive, but others were disappointed in the lack of knowledge and experience human resources had when dealing with retiring employees. Participants noted the importance of understanding their healthcare options and those of people they were caring for. Social Security was also part of their financial planning and required a formal meeting with a representative. The retirees were asked to provide a one sentence answer to what they did the last week of work before they retired. Of the 468 respondents, by far the largest number of retirees spent their week putting everything in order, 37% (n = 173). 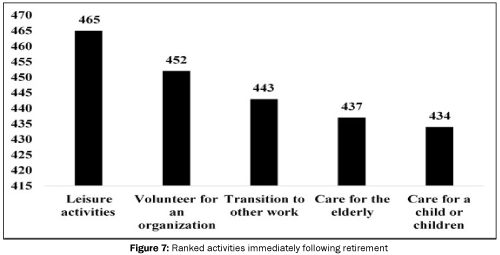 (Figures 4-6) show the retirees’ activities undertaken the “week before” (Figure 4), the “day before” (Figure 5), and the “day after” (Figure 6) they retired. One of the more interesting parts of the survey findings concerned moving into the next phase of life with individual plans that were referred to as a ‘bucket list’. A total of 483 (95%) responded to this inquiry. Of those who responded, only 38.5% (n = 186) said they had a ‘bucket list’. The researchers solicited information on what constituted their ‘bucket lists’. Travel was by far the highest priority on the list of things to do in retirement 71% (n = 139). Their lists of places to go included Europe, Australia, New Zealand, Canada, Hawaii, the Pacific Northwest, Coast to Coast in the United States, and one wants to travel to Mercury and observe outer space. The modes of transportation were as diverse as the locations with cruises, trains, planes, buses, cars, hiking, and possibly a space ship. Their interests ranged from places they have never seen to places they wanted their spouses, family, and friends to see that they had already visited or had worked there. Some wanted to write, photograph, or explore. Others wanted to visit children, grandchildren, and old friends. Figure 4: Activities the week before retiring. Figure 5: Activities the day before retiring. Figure 6:Activities the day after retiring. Of those who said they did not have a ‘bucket list’ of retirement goals, 61% (n = 297), there were 259 (87%) who commented on what would be on their list if they had one. Travel was also the highest priority for 115 (44%) and their travel wishes included foreign countries and family and friends they had not seen in a long time. There were responders without a ‘bucket list’. There were 29 (11%) who indicated they had been involuntarily retired, either through downsizing, company closings, or health issues, and their only ‘bucket list’ was to pursue financial security and survive. Travel was by far the highest priority on the list of things to do in retirement both for those who had a ‘bucket list’ and those who did not. Other ‘bucket list’ items included time to do what they wanted, writing, achieving financial security, taking care of their health, volunteering, visiting friends and family, and maintaining their present ‘happy state’. Continuing the after retirement activities theme, participants were asked to rank the activities they actually did immediately following their retirement. They were asked to specifically rank five items: (a) transition to other work, (b) leisure, (c) care for the elderly, (d) care for children, and (e) volunteer. There were 93% (n = 474) responders and their resulting rankings placed leisure activities highest 98% (n = 465), followed closely by volunteering 95% (n = 452), as presented in (Figure 7). Figure 7:Ranked activities immediately following retirement. There were 170 participants who chose to further comment on the activities they were doing following retirement. Volunteering was a fulfilling choice of 16% (n = 28) who said they were happy to have time to give back and to find another outlet for the socializing that they previously had in their work environment. This was closely followed by those doing home projects, 15% (n = 25). There were 12% (n = 21) of the retirees struggling to find their way through the transition to the next phase of their lives. Some felt ill-prepared either because of having to involuntarily retire or lack of good counseling as they transitioned from work to retirement. A large number moved forward with purpose as seen in (Figure 8). Figure 8:Expanded comments on activities in retirement. After establishing their place in the retirement phase of their lives, the retirees were asked to reflect on their retirement image from two perspectives - that of others and their own. They had three choices: positive, indifferent, and negative. A total of 65% (n = 329) reported they perceived others had a positive image of them as retirees, and 73% (n = 372) reported they had a positive image of themselves in retirement. Further exploration of the retirees’ contentment in retirement asked if their retirement experience has been positive or negative so far. Of the 450 who responded, the majority, 90% (n = 403), checked positive and the minority, 10% (n = 47), checked negative. The percentage of positive to negative is consistent with Rutledge’s  research on the status of the retiree as to whether “leaving the labor force was voluntary or involuntary. In the current study the majority were voluntary retirees, 94.3% (n = 478), and the minority involuntary retirees, 5.7% (n = 29). The proportion of positive and negative experiences is parallel to Elder and Rudolph’s (1999) findings of a “strong positive correlation”  to planned retirement and a “negative correlation”  to being involuntarily retired. To support these numbers with specific data on what each of the retirees was doing in retirement, they were asked to give one statement that best describes their retirement experience so far. The researchers categorized the statements by clustering similarities. Of the 439 respondents who chose to comment, 33% (n = 147) stated that they were enjoying the freedom to do what they want to do when they want to do it. Another 13% (n = 59) said they enjoyed being busy doing what they did not have time for while they were working. Volunteering was one of the positive experiences and 8% (n = 37) of the retirees felt retirement gave them the time to actively pursue helping others. The statement that retiring was the best decision ever was made by 5% (n = 20) of the responders. Leisure, 4% (n = 16), travel, 3% (n = 15), and time with family, 3% (n = 12), were positive experiences. Nine (2%) of the retirees felt it was a plus that they could work whenever they wanted or needed for extra money. Being able to provide care for family members who were ill was a very positive experience for six (2%) of the retirees who would not have been able to provide care if they had not retired. Four (1%) said early preparation paid off in setting them up for a happy and financially stable next phase of life. On the negative side, 24% (n = 104) of those who were not contented in retirement were involuntarily retired and had a very difficult time adjusting. They were really worried about their financial situation and worried about possible changes in their pensions, Medicaid, and Social Security. The demographics of population, of those who reported their gender, consisted of 61% (n = 290) males and 39% (n = 187) females. Those who reported their ages were 90% (n = 456) of the retirees and fell into three categories: (a) 18% (n = 83) were between the ages of 50 and 55, (b) 40% (n = 184) were between the ages of 56 and 62, and (c) 41% (n = 189) were between the ages of 63 and 70. The 467 responders (92%) who reported their occupational locations were 44% suburban (n = 204), 42% urban (n = 194), and 16% rural (n = 69). The educational status at retirement as reported by 93% (n = 472) of the respondents is seen in (Figure 9). 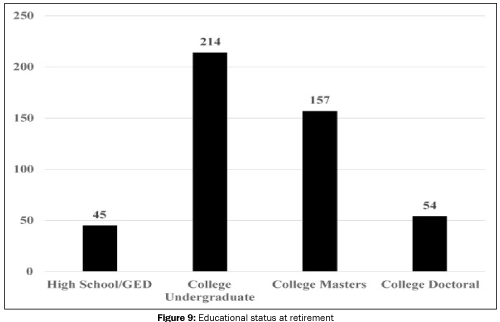 Figure 9:Educational status at retirement. Another question asked respondents how many times they retired. Of the 440 (87%) who answered this question, it was the first time retiring for 75% (n = 329) of the respondents. Another 17% (n = 73) were on their second retirement, and 4% (n = 18) were retiring for the third time. Five percent (n = 20) were on their fourth retirement. The majority of the retirees, 48% (n = 224, had been retired for over four years, 11% (n = 48) had been retired for three years, and 11% (n = 50) for two years. Thirty-one percent (n = 144) had retired within the previous year. An important factor in sustaining a positive retirement experience is a financial one. The household incomes of 56% (n = 286) of the retirees who chose to answer this question fell in the $50,000 – 99,999 income levels. These income levels are seen in (Figure 10). Though the survey included opportunities for responses to comment, the researchers added a focus group session to gain specific information that could add depth to these findings. When participants completed the electronic survey they were asked if they wanted to volunteer to participate in a discussion with the researchers once the survey was closed. An Adobe ConnectTM focus group session was set with five volunteers and the two researchers. A discussion of the focus group interview follows. The participants were asked to reflect on the survey question concerning the steps taken in preparation for retirement. They were asked to think of advice they would give to upcoming retirees. One of the interviewees retired due to a disability. She said it was important to start with human resources when thinking of retiring and speak to someone familiar with disability retirement. The other participants discussed the need to look into personal budgets, finances, and consider possible outside forces that would affect them in the future, including the future of their organization’s pension and healthcare provisions. Next the researchers sought to explore who/what helped them the most as they prepared for their retirement. The group agreed that family, friends, and colleagues who had retired provided much-needed support in making the move to the retirement phase of their lives. Some of the volunteers said that a psychologist and the employee assistance program helped them talk through the risks and benefits in retiring. Then the researchers asked who/what they thought could have better prepared them for their retirement. One important point that was stressed was the need to plan early, make better investments while working, and research what other retirees were experiencing. They indicated retirees needed to understand the problems that are inherent in needing healthcare, equipment such as electronic wheelchairs, and the mentality that comes with leaving the social side of the workplace. All stressed the importance to cultivate a hobby, volunteer groups, or activities that would have been stimulating earlier in the retirement planning. Leaving the workforce one day with no plans for the next part of life is as bad as not planning financially. The researchers wanted to explore one thing the retirees were not completely satisfied with in their retirement. Their answers included: (a) personal health, both mentally and physically, (b) eroding financial and health benefits and the shock and fear this brings, (c) changing family relations, (d) reduced activity with little feedback, and (e) not being satisfied with changes for which they had no control (e.g., health, inclusion with family activities, changes to retirement benefits). Another question the researchers asked concerned the best outcome of their retirement. The volunteers said the best outcome was being free to volunteer more frequently and with a greater commitment. Now they had time for self, health, and being away from the job. All agreed it was the ‘freedom’ to do what they wanted, when they wanted. Finally the group was asked what communication/information they would find beneficial now that they are retired. They expressed a need for a one stop location for information for retirees that includes status updates on what is about to change that will affect them. They want information on ways to become involved in preparing those younger to plan wisely. They agreed that AARP has information that is often helpful and reliable, and they need to find a way to share interesting experiences they have had, and are having, in retirement with others and those planning for retirement. This research investigated contentment factors in retirement of 507 individual retirees. It explored both the confident and positive factors that come with a voluntary and planned retirement, and ones that come due to downsizings, closures, and health issues. Retirement is a “transition between two significantly different stages of life”  . As such, it is important to make that transition as positive as possible. The “dramatic increases in life expectancy present a great challenge”  to listen to those who are in all different stages of retirement so as to foster a positive, planned approach for the rapidly increasing numbers of retirees. It is very important that, “in addition to the financial and health aspects of the retirement decision, policymakers, human resources specialists, the Social Security Administration, and those in the position to guide the choices of future retirees understand the possible behavioral and psychological features of the retirement decision” . This research included a large diverse group of men and women, between the ages of 50 and 70, located in the Mid-Atlantic States, mostly college educated, with an income of $50,000 to $150,000. Their top motivational factors for retiring were ‘the perception they had enough money’ and ‘time’ (time in life and time to enjoy life). In further comments, the majority wanted to travel. Also within the group were a smaller number of retirees whose education stopped with a high school degree or a GED, and whose income was under $25,000 annually. Their motivation for retirement was often due to a change in work conditions and unemployment (needed Social Security to live). The combination of the survey and focus group data added depth and perspective to the topic of retirement contentment. This study surveyed retirees to develop insight into several retirement questions. One of the research questions focused on those factors of retirement influenced by resources, such as income and financial assets, along with expectations of happiness and contentment. The respondents reinforced the weight of the factors of finances, health, time, and personal health constraints that affected the age and stage of their lives when deciding to retire. The second research question set the foundation for the research to discover how time and personal constraints affect the age and stage of life to retire. Many of the retirees became responsible for caring for family members, encountered personal health problems, and wanted to use their time to volunteer, travel, or visit family. The third research question sought answers on contentment factors that led to a positive, confident approach to retire as compared to a retirement that was mandated by employment changes. From the survey and personal interviews, it was found that voluntary and planned retirement led to a more positive, confident retirement experience. By contrast, those that were forced to retire with little or no planning, through reorganization or other workplace environmental issues or health issues, were struggling to adapt. Focusing on finances, emotional and mental preparation, supportive family, friends, other retirees, and having a plan for the “transition between two significantly different stages of life”  was an overarching theme discovered in this research. The recommendation is for all support organizations involved in processing people from work to retirement fully understand the economic, psychological, and social impacts of the transition from work to retirement for all. There are several recommendations the researchers suggest following this study. A majority of the respondents to this study were well educated and had sufficient retirement income. A wider demographic of US retired people with diverse economic holdings should be studied to determine their contentment with retirement. Another recommendation is to expand the survey to discover the impact of information provided through online resources and how this can impact retirement contentment. What kinds of learning opportunities are being offered or can be offered to expand the opportunities for retirees to find pertinent information on their benefits, to communicate with family and friends, to enjoy culture and the arts, and to move forward and not be left behind ? A projection of an increase in life expectancy by the Census Bureau states “by 2030 one in five Americans will be 65 or older” . Also “Social Security’s delayed retirement credit is fully phased in”  which means that workers remaining in the workforce longer than their sixties requires attention to an ever-increasing elder population and their need for quality of life. The future includes a larger population of retirees with a need for a sense of control, social relationships, and a strong financial status. The increase in life expectancy requires an increase in studies weighing the motivational factors that influence people to retire. Lytle MC et al. Current trends in retirement: Implications for career counseling and psychology. Journal of Career Development. 2015;42:170-184. Calvo E et al. A gradual exit may not make for a happier retirement. Chestnut Hill MA: Center for Retirement Research. 2007;1-3. Suzman R and BeardJ. Global health and aging. National Institute of Health. 2001. Friedberg L et al. What effect do time constraints have on the age of retirement? Chestnut Hill MA: Center for Retirement Research at Boston College. 2008;1. Bender K A. The well-being of retirees: Evidence using subjective data. Chestnut Hill MA: Center for Retirement Research at Boston College. 2004;1. Chalofsky N. Meaningful work. T+D (Training & Development). 2003;59:52-58. Maslow A H.A theory of human motivation. Psychological Review. 1943;50:370-396. Super DE. Career education and the meaning of work. Washington DC1957; U.S. Government Printing Office. Super DE. Career education and the meaning of work.Ann Arbor MI: University of Michigan Library. 1976. Matuska K and Christiansen C.A proposed model of lifestyle balance. Journalof Occupational Science. 2008;15: 9-19. O’Connor Fand Holland D. Boomer expectations in retirement. Washingon DC. Insured Retirement Institute. 2015. Niles SG and Harris-BowlsbeyJ. Career development interventions in the 21st century. Upper Saddle River NJ: Pearson Merrill Prentice Hall. 2005. Caudron S. The search for meaning at work. Training & Development. 1997;51:24-27. Gray KC and Herr EL. Workforce education: The basics. Boston: Alyn & Bacon. 1998. Hillgendorff G. Why do we work so hard? The Huffington Post.2013. Rutledge MS. Point of no return: How do financial resources affect the timing of retirement after a job separation. Chestnut Hill MA: Center for Retirement Research at Boston College. 2013;4-10. Elder HW and Rudolph PM. Does retirement planning affect the level of retirement satisfaction? Financial Services Review. 1999;8:117-127. Coile C and Levine P. Recessions retirement and social security. American Economic Review Papers and Proceedings. 2011;101:23-28. Khan M et al. How do subjective longevity expectations influence retirement plans. Chestnut Hill: Center for Retirement Research at Boston College. 2014;2. Hamermest DS and Donald S. The time and timing costs of market work. National Bureau of Economic Research. 2007. Fraenkel JR et al. How to design and evaluate research in education (8th ed). New York: McGraw-Hill. 2012;393-394. Gay LR et al. Educational research. New York: Pearson. 2012;185. Creswell JW. Educational research. New York: Pearson. 2012;377. Helman R et al. The retirement confidence survey: Confidence rebounds for those with retirement plans. EBRI Issue. Washington DC: Employee Benefits Research Institute. 2014. Employee Benefit Research Institute and Greenwald Association. Retirement confidence survey.2014. Schultz SK et al. The influence of push and pull factors on voluntary and involuntary early retirees' retirement decision and adjustments. Journal of Vocational Behavior. 1998;53:45-57. Kim S and Feldman D. Working in retirement: The antecedents of bridge employment and its consequences for quality of life in retirement. The Academy of Management Journal. 2000;43: 1195-1202. Occupational Outlook Handbook. Office of occupational statistics and employment projections. Washington DC. U.S. Bureau of Labor Statistics. 2014. Rowe J and Fried L. Beyond Medicare reform: Strategies to enhance health and well-being in older persons. Public Policy and Aging Report. 2013. Knoll M. Behavioral and psychological aspects of retirement decisions. 2011. Colby S and Ortman J. Projections of the size and composition of the U.S. population: 2014 – 2060. Current Population Reports Release Number CV15-TPS.16 25–1143. Washington DC: U.S. Census Bureau. 2014. Munnell A. The average retirement age: An update. Chestnut Hill: Center for Retirement Research at Boston College. 2015.